be out soon," I said to him, "when do you think baby will be born?" Without hesitation my son said, "Tomorrow, baby be born in the pool." headed to daddy's hockey game, labor began. Mama?" my son asked as I hunched over a bit walking to the door. Kai," I said gently squeezing his hand, "Soon." phone. I wanted to call my doula and let her know what was going on. back against the tree, I squatted again, humming down the pain. quite sure it was labor, but something was happening. the car door for me. He helped me in and asked how I was feeling. wonderful. Soon we were home and I was pacing around the house. The pain began to rise and fall and resemble traditional contractions. Time to call my doula and my midwife again. feeling her leg push into my right side as another contraction began. breathed and sang through the contraction waves together. contractions together as Daddy and Malachi headed up to sleep. Almost Friday morning but although I was tired, I could not sleep. that had since subsided and the night air was full of promise. pain. Rocking and singing and seeing her little head come down. excitement and encouragement seeped into me as I held on to him. singing, yelling, grunting… Nothing else existed for that moment. from the rain but my tangerine-lavender birth candle still was glowing. the edge of the tub calmly watching, supporting, loving. her up to kiss her, smell her, feel her. cuddling in the warm water. watching her breathe in air. womb walls for so long. and so ready to fall into each other and collapse. or smile of excitement on my son's face. 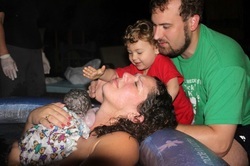 And Malachi was right – baby was born on Friday in the pool.